I like a restaurant which feeds you the moment you walk in. 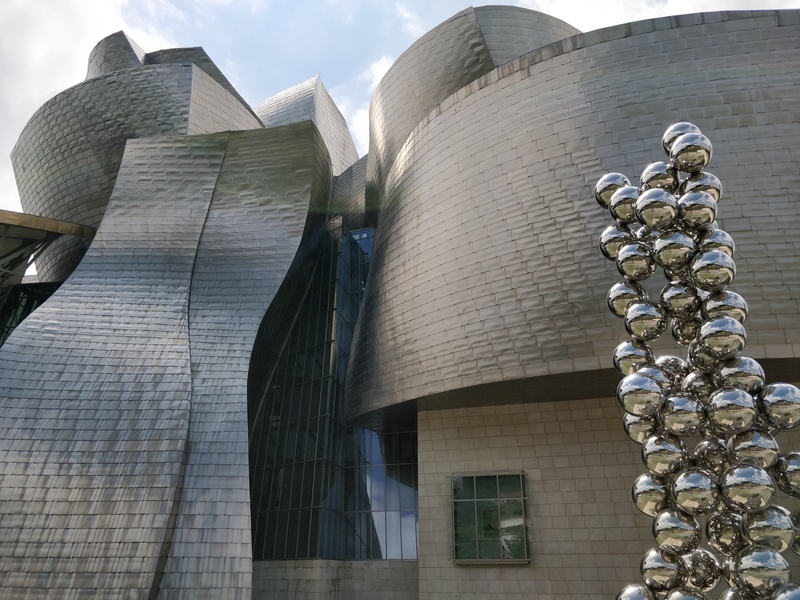 Within 10 minutes of arriving at Nerua in Bilbao’s Guggenheim Museum, we’ve tasted the following: chickpea and vegetable broth, quail’s egg and king prawn foam, tempura codfish and kototxa cream then potato with lettuce and red onion. It’s the perfect introduction; no long-winded explanations about the concept, just proof of its excellence on a plate. There is a concept, of course, but like the décor, it’s wonderfully understated. We’re given time to settle into our Frank Gehry-designed wooden seat – incidentally this is the only artwork around – before being handed the menus. As we glance through the options, most of the ingredients are familiar, while others intrigue us. What becomes crystal clear is the concept: the utmost respect for local produce, served at its peak, with minimal intervention. Experimenting with each ingredient to unlock its potential is a year-long journey carried out by Nerua’s R&D team. At the helm is Head Chef Josean Alija, whose mission is to champion the Basque Country’s rich culinary heritage. Menus take their names from the number of courses and are changed thrice yearly: spring, summer and autumn/winter. 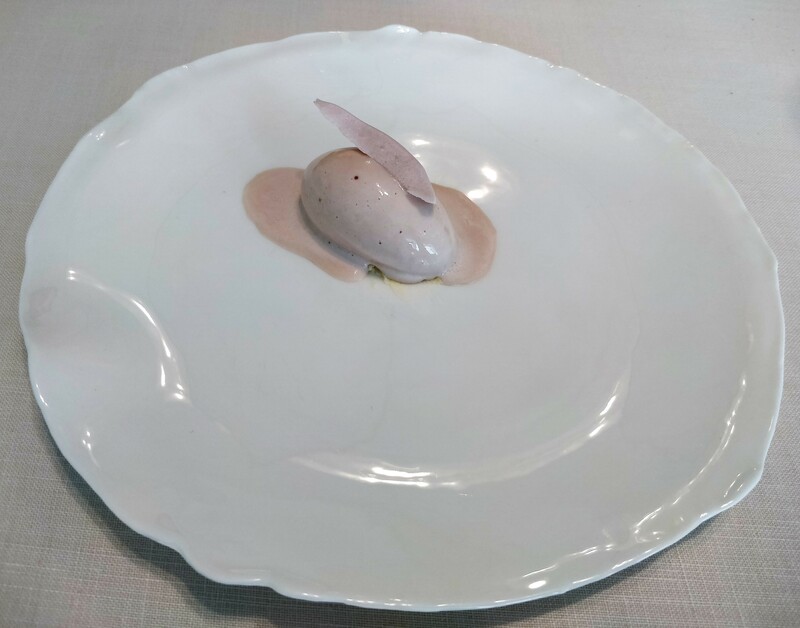 We visit in June, two weeks before the city hosts The World’s 50 Best Restaurants awards; Nerua goes on to chart at #57. 5 courses (with paired wines for a mere €20pp) become 9 as we deviate from our original choice. 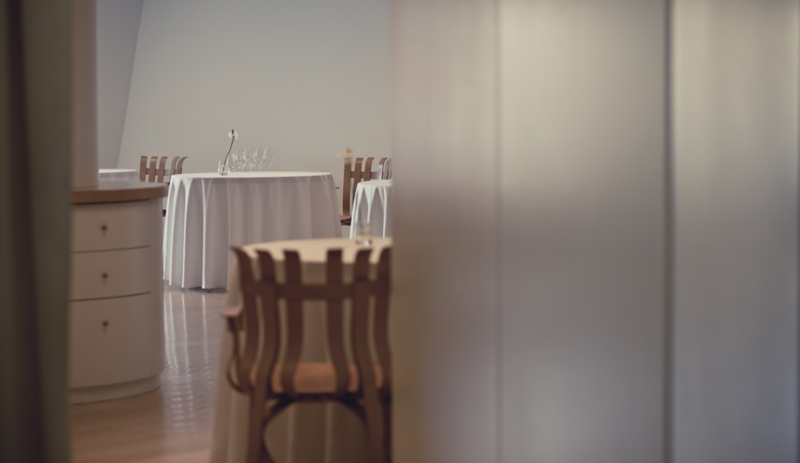 While we nibble on sourdough dipped in olive oil and cornbread, we observe the stark elegance of the room; it’s like a blank canvas. This feeds through onto the plate: each course showcases a single ingredient and is accompanied by two or three others intended to enhance it. Tomato lasagne is a matchbox-sized mouthful of smoothness: thin layered slices covered in an even thinner coating of the staple Spanish fruit, with egg white drops in an onion sabayon. After smooth and slightly sweet comes the spicy note of Mexican chili. Since tasting some of the ripest, most intensely-flavoured tomatoes in San Sebastian last year, they’ve come to symbolise Spain for me. I couldn’t have asked for a more fitting first dish. Then a welcome surprise from the kitchen: guisantes lágrima. 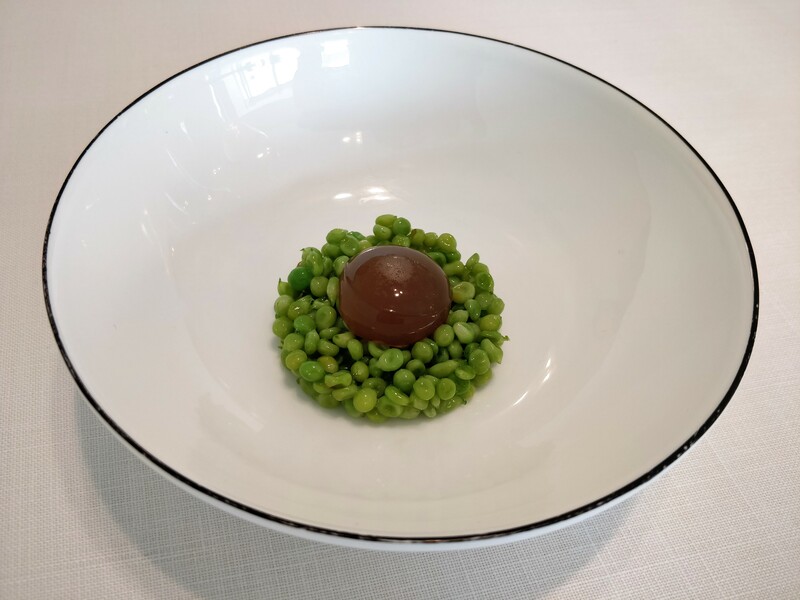 Known as “green caviar”, these tear-shaped peas are prized by Basque chefs for their unique sweetness, and only available between March and June; we got lucky. Once we try them, with a wobbly smoky squid jelly in the form of an egg yolk, we understand just how lucky. Artichokes follow, whole and gently bobbing around with black olives in an anchovy broth. 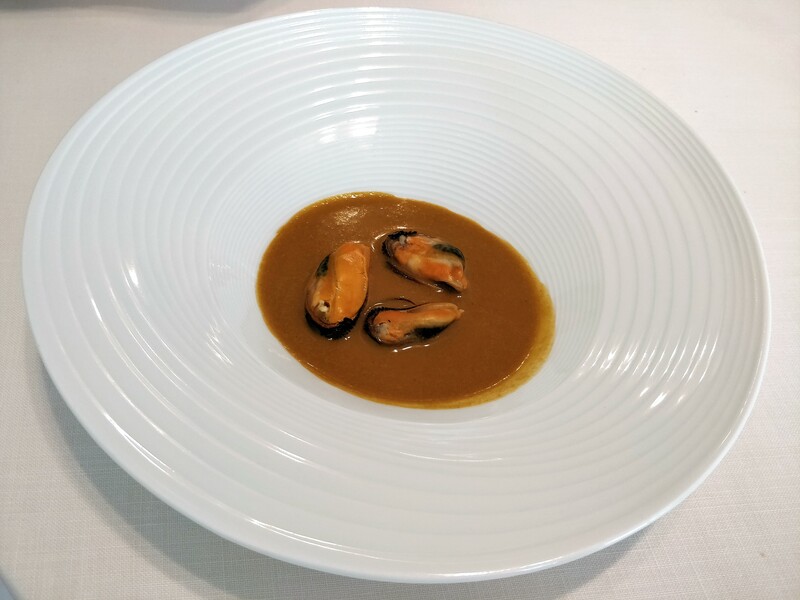 From hints of the sea to fish-centric plates: an oyster on the edge of a glossy, jet-black pool of ginger-spiked fish sauce, and a trio of plump mussels, naked in a caramel-coloured fish sauce. And Zurrukutuna, a traditional garlic soup with tiny morsels of salt cod fish and local bread, the revered cod cheek resting on the shiny surface. A touch of paprika transforms the dish into a rust-hued liquid. 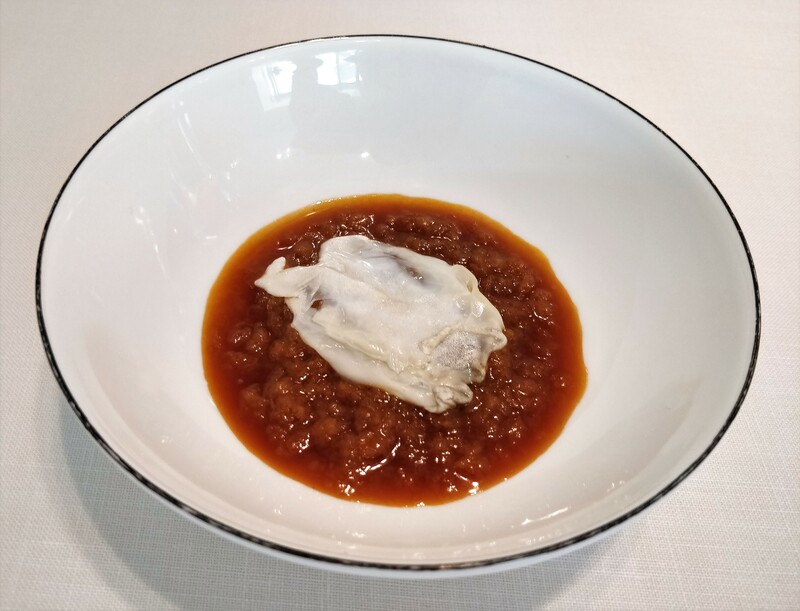 Interestingly, the soup’s name is derived from the onomatopoeic Basque word zurrup, meaning a “sip” or “slurp” – an urge to do so is strongly supressed – while kutuna means “pleasant”. 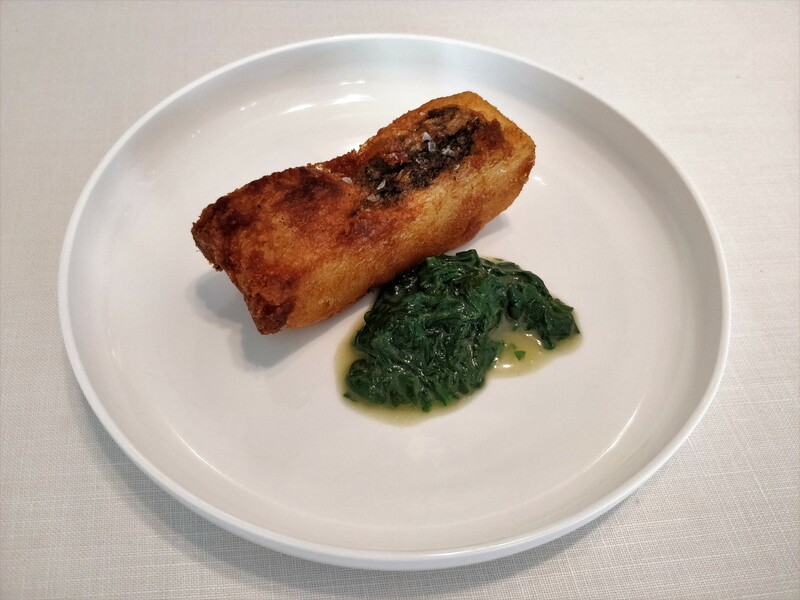 The final highlight is the hake coated in light-as-a-feather batter alongside stewed water spinach. The sole meat main, marinated rack of lamb on celeriac cream, is tantalisingly tender, its centre all fuchsia pink and juicy. If being able to finish it is an initial concern, we go on to complete to the challenge admirably. Deep pinks fade to candy floss tones as we move into sweeter territory: a single quenelle of strawberry ice cream on whipped milk casein, a cuttlebone-shaped violet meringue artfully perched on top. Each flavour is as gentle as a fleeting caress, the colours so light they almost blend into the plain white plate. Butter mochi is every bit as soft, silky and luxurious as imagined. 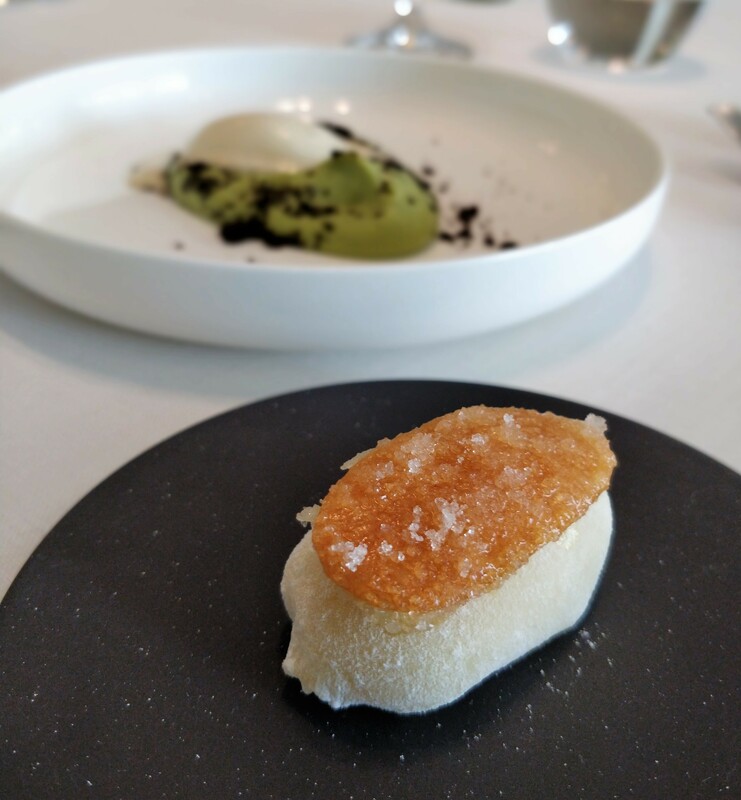 Then when we think we’ve reached peak sweet, we find ourselves scooping spoonfuls of black olive and coffee crumb-flecked avocado cream and fenugreek ice cream; the mature savoury notes knowingly tame their potentially overpowering dishmates. Stripping a dining room back to basics and having very few tables creates an island-like atmosphere around each one, which could’ve left us feeling isolated. Instead, you get intimacy interspersed with front-of-house friendliness, plus exciting food. You won’t find the buzz of pintxos bars here, but you’ll remember this meal fondly long after you’ve eaten it. Budget: €80 for 5 courses, €110 for 9 and €145 for 14 (lunch menus; excluding wine and service). 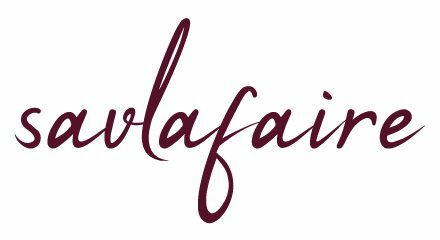 All words and images are my own (excluding the Nerua interior (credit: Nerua)) and remain the trademark of www.savlafaire.com. What a memorable meal, Seetal. 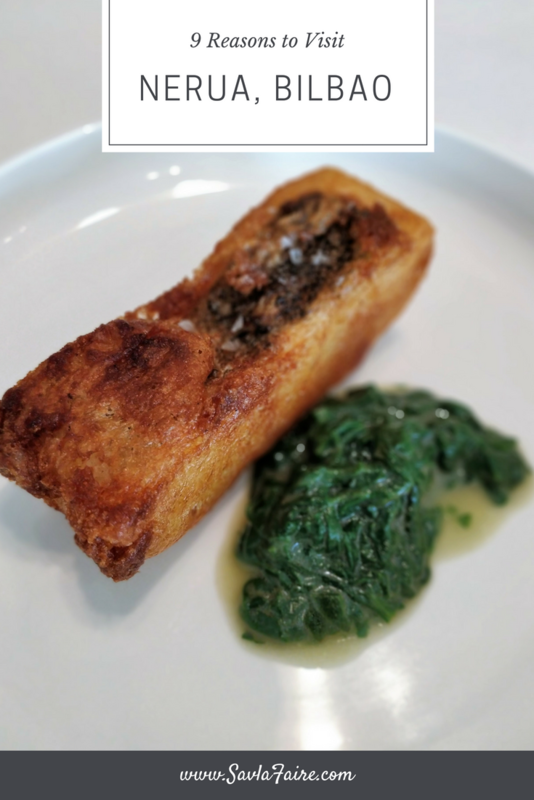 This is my type of food too – keeping things simple, but in a clever way that allows the ingredients to shine. And the Basque style of cooking seems quite unique too – would love to try it some day..